TrépanierBaer is pleased to announce that James Carl will be featured in the Special Projects component of this year’s Papier Contemporary Art Fair. Spread throughout the fair, these special projects will offer visitors the opportunity to contemplate large-scale works in an immersive and unique context, and we invite you to visit this project, along with our booth C04 where we will present specific works by: James Carl, Vikky Alexander, Luanne Martineau, Kent Merriman Jr., Ryan Sluggett, Chris Cran, Will Mentor, and Ron Moppett. Carl’s oof is a site-specific monumentally-scaled sculptural wall relief. In response to the challenge to create such a work, Carl conceived oof based on the iconic cast-pulp commercial egg carton as a formal starting point. 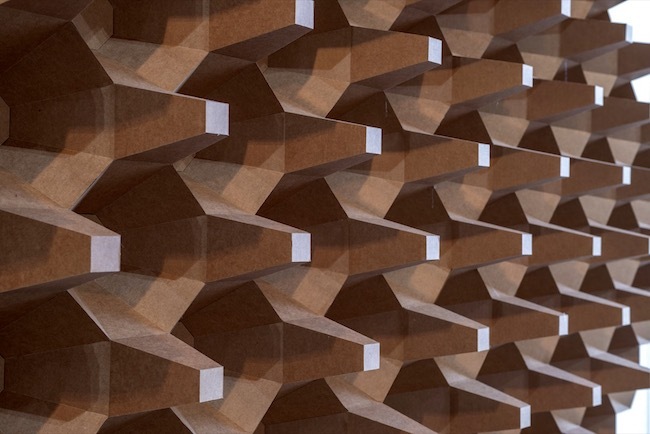 The entire work is constructed from corrugated brown cardboard that has been computer-cut into multiple parts then hand-assembled. The resulting wall relief offers a dramatic visual experience that simultaneously has the effect of flattening the acoustics of space. As with much of Carl’s work, oof makes use of common materials and cultural reference points in the generation of a visually charged experience. Cardborad was a signature material for Carl in the 1990s. He first worked with the egg carton pattern in a small work that was shown at PS 122, New York in 1997. The title of the work alludes simultaneously to the visual punch of the piece and to French word oeuf, meaning “egg”. Other examples in American culture of such an approach to surface modulation date to the early days of Rock n’ Roll when egg cartons were used to balance the acoustics of recording and performance spaces. This approach became the norm and used by “garage” and “grunge” bands from New Jersey to Seattle to Montréal. Relief sculpture is explicit in its reliance on architecture to give it a place in the world. It struggles with three dimensionality and autonomy, using spatial illusion, pattern, and implied movement as means to exceed its architectural confines. In both Neo-Classical and Modern examples, relief-sculpture is exploited for socially didactic purposes – affording walls a voice. We look forward to seeing you at our booth at Papier!